Home > Membership > Nonprofit World > Can You Create an App (or Something Better) for That? Can You Create an App (or Something Better) for That? 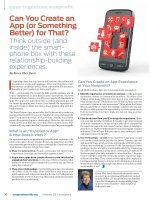 Think outside (and inside) the smartphone box with these relationship-building experiences.